The world has invested 2.9 trillion dollars in green energy sources since 2004, Global Trends in Renewable Energy Investment 2018 report released Thursday shows. The report jointly published by the United Nations and Bloomberg New Energy Finance shows a steady move away from fossil fuel-based power production to ‘green’ power sources. Investors worldwide in 2017 ploughed a record $161 billion into solar energy, the report says, more than half the investment in all renewables apart from large hydroelectric projects. Total investment in renewables rose 2 percent to $280 billion that year with China having the largest share of $127 billion investment, inits bid to no longer be seen as the world’s worst polluter. 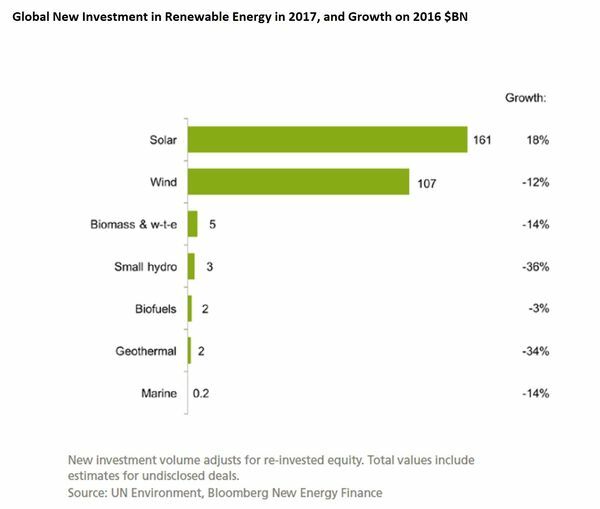 Developing economies accounted for a record 63 percent of global investment in renewable energy in 2017, up from 54 percent in 2016, as Europe’s share of world investment fell to just 15 percent in 2017, the lowest recorded since the data series began in 2004. Renewable energy investment in the U.S. was $40.5 billion, down 6 percent. In 2017, $103 billion was invested in new fossil fuel generators while $42 billion went into new nuclear reactors, and $45 billion to large hydro dams.